Not that wheel! I mean, sometimes that one turns slowly, and sometimes quickly. Lately it's been turning very noisily, which I need to address but haven't yet. No, I mena the gears in my brain. I've been working on a couple of ideas for sideline products - and by "working on," I mean briefly remembering that they exist - for maybe two years now. 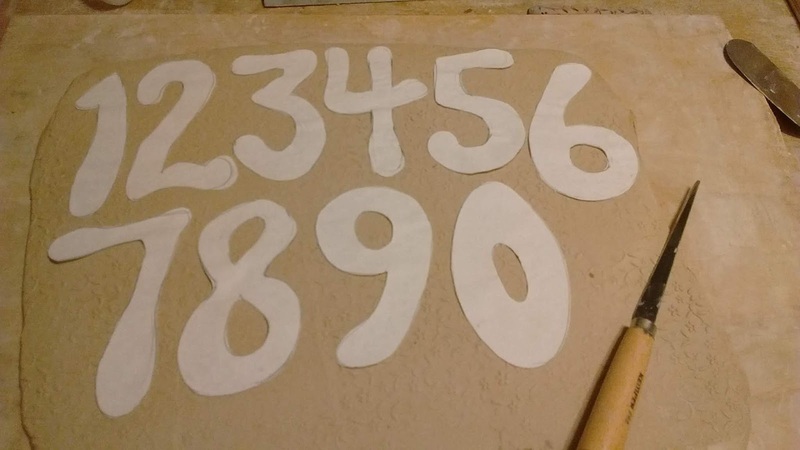 One of those is handmade address numbers for homes. It's been rattling around in my brain since I made a set for my own house. I made a couple of sets for relatives for Christmas, and they came out well - now it's time to make the prototypes and templates. I did some quick math, first: if I want the numbers to be 4" high after firing, I have to make them...let's see...4.6. So, 4 5/8, if I don't feel like switching to metric. I would, if I had a need to be precise, but a finished size of 4-ish inches works here. I'm feeling good about all the letters except maybe the 8...the 0 also maybe needs the hole a little bigger. I want them to look like they belong together, a sorta-casual, funky, handmade font...the 8 is a little bit formal, the 0 a little bit cartoonish. Or perhaps I'm over-thinking again. Anyway, got these cut out, and the edges compressed...now for the slow work of preventing warping. The easiest way would be to dry between two pieces of drywall, but I only have one. So I put down some newsprint beneath the letters, covered them with plastic, and put a towel over that, and a bat on top of that. That's how I persuaded these soon-to-be Christmas ornaments to stay flat. Yes, I made Christmas ornaments. In February. As I say, the wheels turn slowly! If I want to have them in December, I have to start now. 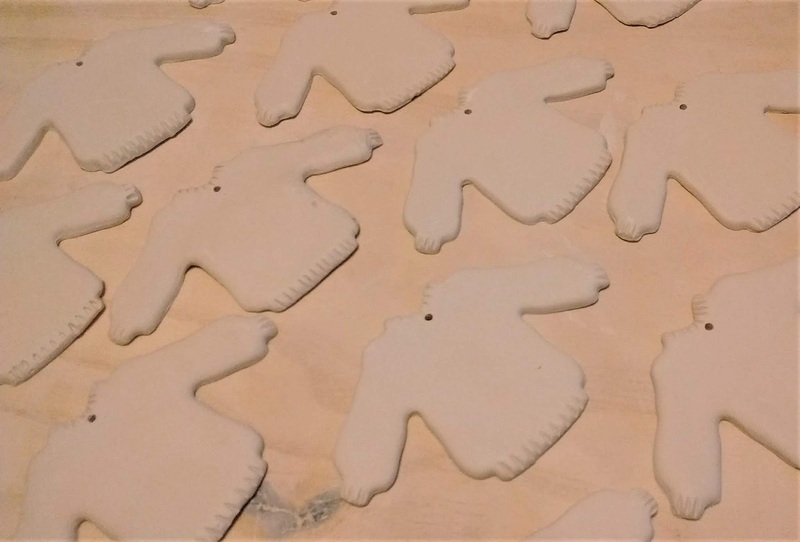 I don't do much Christmas decorating myself - I'm a "quiet contemplation" kinda lady, myself - but when I saw this cookie cutter, it made immediately imagine the fun of decorating these. I'm not much for sweets (WHO AM I KIDDING?? I am TOO much for sweets, that's the problem) but as a tree ornament? Kinda clever, right? At art fairs, I always know when another potter has entered the booth, even before they speak: potters always turn pots over to look at the bottom. Mostly, I suppose, because there's a lot of information there - if it's not obvious from looking at the surface, a glance at the bottom will tell you how the pot was fired. But often, on atmospherically-fired pots, the bottom is as beautiful as the body of the pot. I've just listed some new items in the Pottery Shop (in keeping with #16 on my 19 for 2019 list! I am actually doing it.) When I photograph the pots, I'll usually take a shot of the most beautiful bottoms. Does that make me weird? 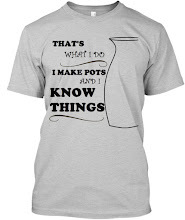 Maybe...or maybe I'm just a potter, like you. Yeah, I see you, turning pots over. Can't fool me. The kiln did all the work, in the case of these particular bottoms, but sometimes I'll put a little slip-trailed curlique within a foot ring, or stencil on an underglaze dragonfly...I like the idea of a little surprise, a tiny treat for the person who washes the pot & puts it away. It's like a wink, passed between me & them: "Thanks for taking care of my creation." A question I am often asked, when people learn that my kiln is outside, is whether I am able to fire in the winter. The answer, of course, is that yes, I can...but I don't always want to. I don't mind firing when it's super-cold, but I hate loading. Three hours (ish) in the gelid air, my hands necessarily bare to handle pots & wadding, the wads freezing to the shelf the second they touch...just, yuck. So I tend not to, unless I really need to, for an order or an event. That doesn't stop me making stuff, though, and after a while my studio starts to fill up. I have at least a kiln load glazed & waiting on the shelves in my studio. Waiting for what? Why, an above-freezing couple of days, of course. We've had a few, but I need a pair together landing on days when I don't have class, ideally. If it's not too cold, I can load one day & fire the next, or even the day after that, as long as the temp doesn't drop too much overnight. If it gets too cold, the wax separates from the pots, taking with it some glaze and flashing slip, so I have to watch out for that. Anyway! Since the ware is all glazed, I am ready to fire at the drop of a..well, a raindrop, it looks like. No problem, I am not made of sugar! In keeping with my 19 for 2019, one of which was "Increase online sales," I needed to do some product photography. I want to be creative with it - find tablecloths that complement but don't distract, choose fruits or veggies as accents to highlight functionality...but that was getting in the way of just getting it done, so I set all that aside for a bit to just take some basic shots. Even that is a several-hours-long-project, which involves rearranging my living room. I'm not sure I'm doing the lights right...should they be that close? idk. Some are easier to shoot than others! Matte glazes or exteriors that are mostly flashing slip/soda glass present less of a challenge than, say, this super-glossy oribe vase! This looks moderately like crap, with all the reflections - can you see me? I should have waved - but the better ones are not all that much better. I have about 10 more pieces to photograph today. Then comes processing! Each photo will need to be cropped & renamed, and in some cases have the light rebalanced. After that, I'll need to take dimensions, write descriptions, and then post these online. This pottery gig is a lot of work! Entities that may be considered cryptids by cryptozoologists include Bigfoot, the chupacabra, or Mokele-mbembe. Related pseudosciences include Young Earth creationism, ghost hunting, and ufology. Some dictionaries and encyclopedias define the term "cryptid" as an animal whose existence is unsubstantiated. 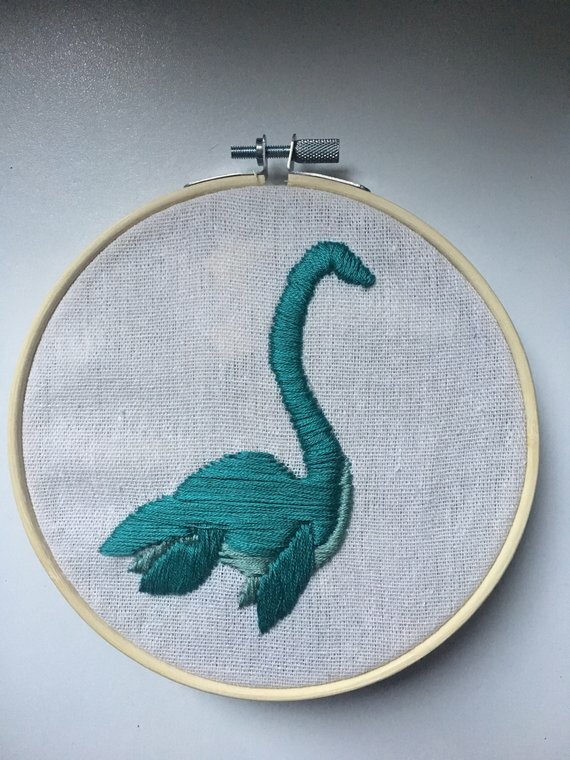 Nessie, Yeti, and Mothman are currently on offer at Cryptid Crafts.